If you want the best performance out of your miniquad racer, we highly suggest you use BLHeli_S ESCs. This is because these ESCs have been developed solely with quadcopter performance in mind. They integrate with your flight controller software to provide some really neat functionality and, with the release of the BLHeli Configurator Chrome app, are exceptionally easy to flash and configure. 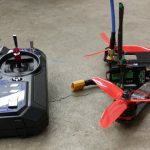 This article provides step-by-step instructions on how to configure freshly-flashed BLHeli_S ESCs so that they all have the correct settings and so that your props are spinning in the correct direction. 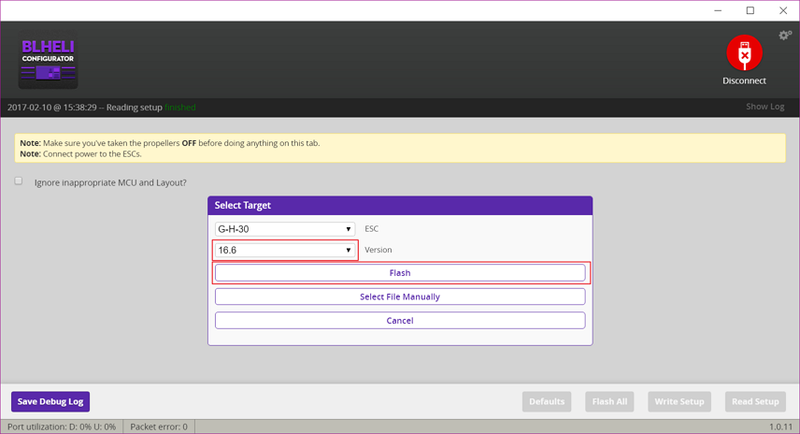 We’ve done this before on the archaic BLHeliSuite Windows program – this time we will walk you through using the fairly new BLHeli Configurator Chrome app. 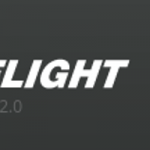 Like Betaflight Configurator, this is a beautiful, modern app which can be used on any operating system to flash and configure your ESCs. The new UI is far easier to use than the old BLHeliSuite that ran on Windows. Still, if you want to use that software – check out our old guide. Before you jump into configuring your ESCs, you’ll want to get a few things in order. First of all, we recommend you remove the props from your quadcopter and plug it into your battery using a smokestopper. The reason is that the process of flashing and programming ESCs always risks a situation where the ESC gets into a corrupted state which can either cause your motor to spin up to full throttle or short out a motor winding and cause serious damage to your quad. Using a smokestopper prevents both of these things and removing your props is cheap insurance to protecting your fingers. 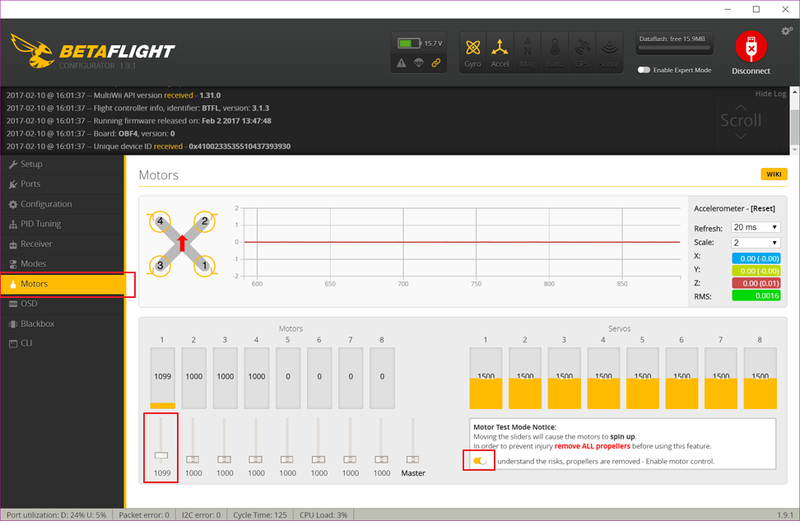 If you’ve just finished building your quad, we recommend you start out by flashing your flight controller with Betaflight. The steps in this guide will not work if your Flight Controller does not support the BLHeli passthrough provided by new versions of Betaflight and/or Cleanflight. This is outlined in the previous article in this series. Now lets get started! 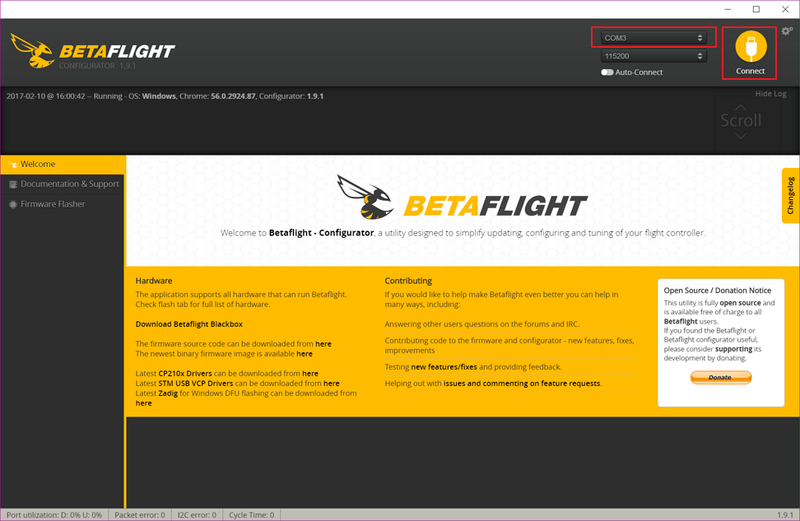 Configuration begins in the Betaflight Configurator Chrome app. Connect to your quadcopter’s flight controller by picking the appropriate serial port and clicking connect. You can tell by unplugging and re-plugging your flight controller into your computer. The correct COM port will disappear and reappear. Go to the “Motors” tab. Click the checkbox in the bottom right that says “I understand the risks” (you did remove the props, right?). Run up each motor using the slider in the bottom left of the Motors tab. Start with motor 1. Move the slider up to ~1100 and note the direction your motor is rotating. Notice the handy diagram in the middle of the motors tab. Is your motor 1 spinning the same direction as motor 1 in that diagram? If not, write down “Motor 1 Reversed” in a notepad. Repeat step (5) for motors 2-4. Close Betaflight Configurator. Two configurators cannot be connected to your quadcopter at the same time. Plug your quadcopter’s flight controller into your computer using a micro USB cord. Plug a flight battery into your quadcopter. Pick the correct serial port – it’s the same one you used in Betaflight Configurator. 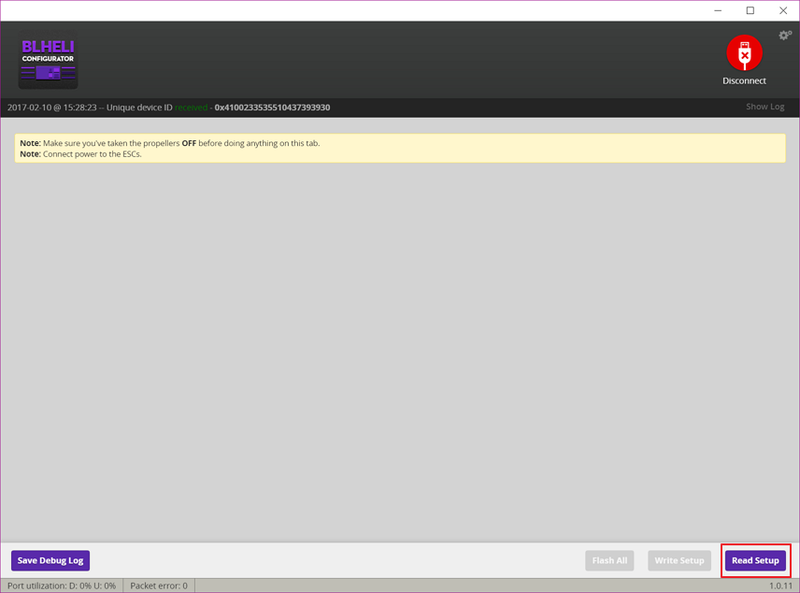 You will be brought back to the main screen where each ESC will be updated, one at a time. If you found your own firmware, you can flash that using “Select File Manually”. 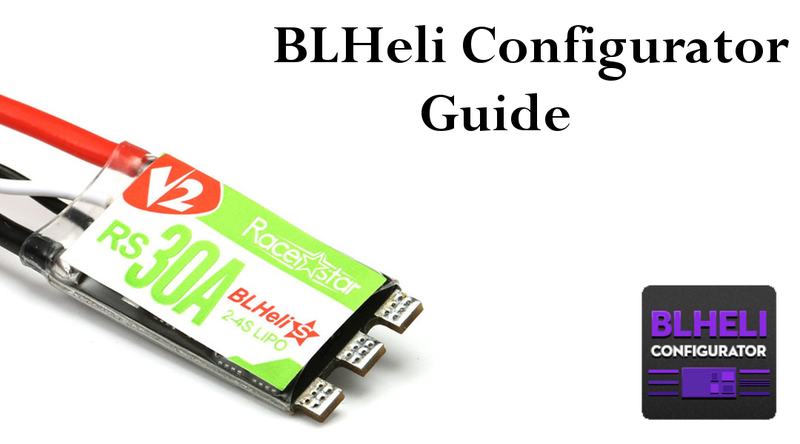 We recommend most folks use the ESC Firmware provided directly from BLHeli configurator. Installation of the wrong ESC firmware can and will completely destroy your ESC. If you do flash your own firmware, only do it to a single ESC at a time! Startup power configures how quickly your ESC responds to rapid throttle changes. It has been reported that lowering it can help fix motor problems on high-performance motors like the new EMax RS2206S series. We do not recommend you adjust this unless you have motor problems in flight, but if you do you should lower it to .25 or .125. Motor timing adjusts how far advanced the ESC drives the magnetization of the field windings when compared to the magnetic fields of the permanent magnets. Again – we don’t recommend you change this on your first set-up unless you specifically know that it needs to be done. Almost all mini-quads run “medium” or “high” timing for maximum thrust. If you are flying with a standard BLHeli ESC (e.g. not a BLHeli_S ESC), a final option will appear here to change “PWM Frequency/Damped”. This should always be set to “Damped Light” for multirotors. This option is automatically enabled in BLHeli_S ESCs and does not show up in the Configurator. Here you will configure motor direction and PPM values for your 1st ESC. Motor Direction: In steps (1)-(6) above, you determined which motors, if any, were not spinning in the right direction. You can now fix this by changing the “Motor Direction” drop down from “Normal” to “Reversed” for those motors which were spinning the wrong way. PPM Values: If you are using DSHOT – and you absolutely should if you have BLHeli_S ESCs – ignore this field. If not, you should change the “PPM Min Throttle” to “1020” and “PPM Max Throttle” to “2000”. 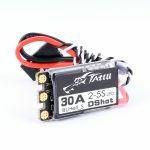 This will give your ESCs the maximum amount of resolution available for smooth flying. Here you will configure motor direction and PPM values for your 2nd ESC. See (5) above for how to do this. Here you will configure motor direction and PPM values for your 3rd ESC. See (5) above for how to do this. Here you will configure motor direction and PPM values for your 4th ESC. See (5) above for how to do this. 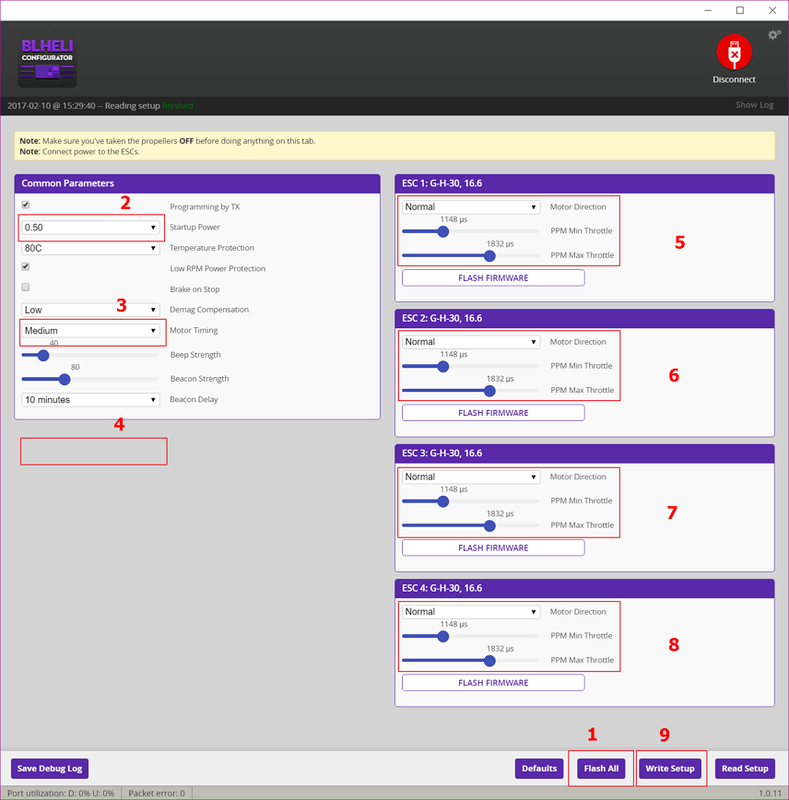 Once all configurations are done (or when exiting the BLHeli Configurator program, e.g. for checking motor direction), click “Write Setup” to save your settings to all 4 ESCs. Disconnect from BLHeli Configurator and repeats steps (1)-(6) to confirm that all your ESCs still work and your motors are now all spinning in the correct direction. That’s it. Once you’ve completed these steps, your ESCs are configured and you are ready to configure your flight controller. If you run into any problems or have questions, please drop us a comment below. We love getting feedback so that we can keep our content as relevant as possible.